I am the girl who dedicates ten minutes to washing my face and any kind of makeup regime, especially in the midst of humid, hot Oklahoma Summers. We are already in the upper 90's with a heat index in the triple digits. My skin is incredibly oily and seems to get even more oily the older I get and I am constantly shiny. Two hours into the day, my blush disappears and my eyeshadow has smudged all over the place and I look like I have two black eyes. I have been craving that fresh finished day time look you see and have been trying to achieve it on my own with no luck. Always looking for it to be simple, I have been going crazy with compact foundation and all sorts of loose powders to help me with my oily issue, not choosing the right color for me and I pile on the concealer, convinced that I am hiding my flaws but I feel like they have just been highlighted, especially under my eyes. I have no idea how to do different tips with my eyes and forget even trying to master the infamous cat eye. And I know I wear too much blush and eyeliner and I do my makeup in my poorly lit bedroom where I do not even open the window shade for natural light. GASP, right?! This is definitely a makeup junkie's worst nightmare. I dedicate zero time to it. This was the exact conversation I had with a fabulous makeup artist yesterday. I met the lovely Krista Perry through a mutual friend and really loved how her makeup looked and her skin was just flawless. She works with many brides and also has a list of celebrity clients. And i love her portfolio. She told me I had beautiful skin and that I shouldn't hide it and wanted to show me some tips, especially with my foundation. She pointed out that I was not wearing the right color. So, my ego was slightly bruised. I love and always look for people who tell me the truth but it doesn’t make it easy sometimes. Am I right?! And beautiful skin? I have never considered myself to have beautiful skin. And what about my pores? (My pores make me feel so self-conscience) And my skin is so shiny; even now I need to go blot. And look at all my imperfections. I have so many beauty marks on my face, including three on my nose. I don't really know how to do my make up? Oh my goodness. Having a mini melt down.What will everyone say and think? Loving this matte look Rimmel London's products are giving me. The color she chose is a soft beige. It is so feather light on the skin and left me with a perfectly smooth, soft, matte finish. It minimized the appearance of my pores and gave me a full 8 hours of shine control. Praise the foundation gods. You guys, this is the best day ever. Rimmel Stay Matte Foundation is seriously gorgeous! She loves to apply foundation with a brush because this works the product into the skin and does not give the illusion that the foundation is sitting on top of the skin. She applied a light contour on my cheek bone giving me an extra boost of color. We then finished my daytime look with a wonderful bright shade of coral called Call Me Crazy. Does anyone else buy lipsticks based on names alone?) She applied this with a brush too and this lipstick was so full of moisture and stayed on for hours! 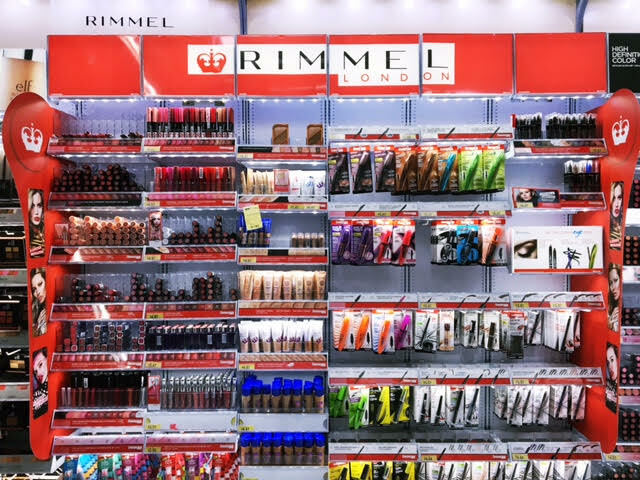 I highly recommend you take full advantage and save $4.50 on Rimmel London with Ibotta. Such an amazing deal! Only twenty minutes to go from day to night...no problem! Day To Night In A Flash. Lately my schedule is booked solid and I often have only thirty minutes to take myself from day to night so I asked Krista for some help here. She kept the foundation the same as we both loved the flawless look I got with Rimmel's Stay Matte Foundation. Krista suggests either playing up your eyes or lips but only one. She created a smoky eye on me by taking a dark eyeshadow and blending it on the outer corners of my eyes creating a sideways V. This instantly enhanced the look. And to mute my lip she actually took Rimmel Stay Matte Foundation and blended it into The Rimmel The only 1 lipstick and it changed the color completely making it a muted tone. How clever is she?! Call us both crazy! Do you like my daytime look best or evening look?! And what do you currently love from Rimmel London right now?! I literally had to jump in the car and rush to my local Wal-Mart Super Center and grab my two summer favorites that we used. This lippie is everything. Shop my fave cosmetic bags here for all of your new loot!